Except within a few kilometres of a ridge crest, where the volcanic rock is still relatively young, most parts of the sea floor are covered in sediments. This material comes from several different sources and is highly variable in composition, depending on proximity to a continent, water depth, ocean currents, biological activity, and climate. Sea-floor sediments (and sedimentary rocks) can range in thickness from a few millimetres to several tens of kilometres. Near the surface, the sea-floor sediments remain unconsolidated, but at depths of hundreds to thousands of metres (depending on the type of sediment and other factors) the sediment becomes lithified. Terrigenous sediment is derived from continental sources transported by rivers, wind, ocean currents, and glaciers. It is dominated by quartz, feldspar, clay minerals, iron oxides, and terrestrial organic matter. Pelagic carbonate sediment is derived from organisms (e.g., foraminifera) living in the ocean water (at various depths, but mostly near surface) that make their shells (a.k.a. tests) out of carbonate minerals such as calcite. Pelagic silica sediment is derived from marine organisms (e.g., diatoms and radiolaria) that make their tests out of silica (microcrystalline quartz). Volcanic ash and other volcanic materials are derived from both terrestrial and submarine eruptions. Iron and manganese nodules form as direct precipitates from ocean-bottom water. The distributions of some of these materials around the seas are shown in Figure 18.9. Terrigenous sediments predominate near the continents and within inland seas and large lakes. These sediments tend to be relatively coarse, typically containing sand and silt, but in some cases even pebbles and cobbles. 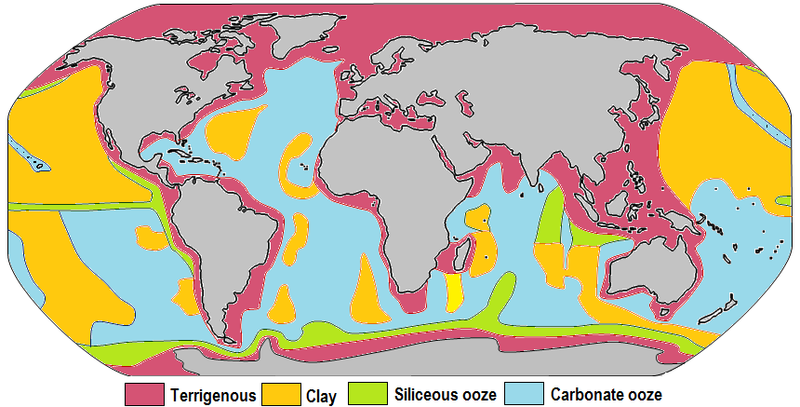 Clay settles slowly in nearshore environments, but much of the clay is dispersed far from its source areas by ocean currents. Clay minerals are predominant over wide areas in the deepest parts of the ocean, and most of this clay is terrestrial in origin. Siliceous oozes (derived from radiolaria and diatoms) are common in the south polar region, along the equator in the Pacific, south of the Aleutian Islands, and within large parts of the Indian Ocean. Carbonate oozes are widely distributed in all of the oceans within equatorial and mid-latitude regions. In fact, clay settles everywhere in the oceans, but in areas where silica- and carbonate-producing organisms are prolific, they produce enough silica or carbonate sediment to dominate over clay. Carbonate sediments are derived from a wide range of near-surface pelagic organisms that make their shells out of carbonate (Figure 18.10). These tiny shells, and the even tinier fragments that form when they break into pieces, settle slowly through the water column, but they don’t necessarily make it to the bottom. While calcite is insoluble in surface water, its solubility increases with depth (and pressure) and at around 4,000 m, the carbonate fragments dissolve. This depth, which varies with latitude and water temperature, is known as the carbonate compensation depth, or CCD. As a result, carbonate oozes are absent from the deepest parts of the ocean (deeper than 4,000 m), but they are common in shallower areas such as the mid-Atlantic ridge, the East Pacific Rise (west of South America), along the trend of the Hawaiian/Emperor Seamounts (in the northern Pacific), and on the tops of many isolated seamounts. Exercise 18.3 What Type of Sediment? The diagram shows the sea floor in an area where there is abundant pelagic carbonate sediment. There is a continent within 100 km of this area, to the right. What type of sediment (coarse terrigenous, clay, siliceous ooze, or carbonate ooze) would you expect at find at locations a, b, c, and d? All terrestrial erosion products include a small proportion of organic matter derived mostly from terrestrial plants. Tiny fragments of this material plus other organic matter from marine plants and animals accumulate in terrigenous sediments, especially within a few hundred kilometres of shore. As the sediments pile up, the deeper parts start to warm up (from geothermal heat), and bacteria get to work breaking down the contained organic matter. Because this is happening in the absence of oxygen (a.k.a. anaerobic conditions), the by-product of this metabolism is the gas methane (CH4). Methane released by the bacteria slowly bubbles upward through the sediment toward the sea floor. At water depths of 500 m to 1,000 m, and at the low temperatures typical of the sea floor (close to 4°C), water and methane combine to create a substance known as methane hydrate. Within a few metres to hundreds of metres of the sea floor, the temperature is low enough for methane hydrate to be stable and hydrates accumulate within the sediment (Figure 18.11). Methane hydrate is flammable because when it is heated, the methane is released as a gas (Figure 18.11). The methane within sea-floor sediments represents an enormous reservoir of fossil fuel energy. Although energy corporations and governments are anxious to develop ways to produce and sell this methane, anyone that understands the climate-change implications of its extraction and use can see that this would be folly. As we’ll see in the discussion of climate change in Chapter 19, sea-floor methane hydrates have had significant impacts on the climate in the distant past. 18.3 Sea-Floor Sediments by Steven Earle is licensed under a Creative Commons Attribution 4.0 International License, except where otherwise noted.